Salt configuration is very simple. The default configuration for the master will work for most installations and the only requirement for setting up a minion is to set the location of the master in the minion configuration file. The configuration files will be installed to /etc/salt and are named after the respective components, /etc/salt/master, and /etc/salt/minion. After updating the configuration file, restart the Salt master. See the master configuration reference for more details about other configurable options. Although there are many Salt Minion configuration options, configuring a Salt Minion is very simple. By default a Salt Minion will try to connect to the DNS name "salt"; if the Minion is able to resolve that name correctly, no configuration is needed. After updating the configuration file, restart the Salt minion. See the minion configuration reference for more details about other configurable options. A proxy minion emulates the behaviour of a regular minion and inherits their options. Similarly, the configuration file is /etc/salt/proxy and the proxy tries to connect to the DNS name "salt". In addition to the regular minion options, there are several proxy-specific - see the proxy minion configuration reference. For information on salt's logging system please see the logging document. To run Salt as another user, set the user parameter in the master config file. 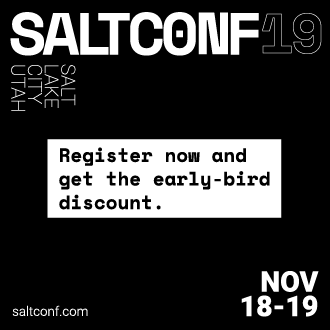 More information about running salt as a non-privileged user can be found here. There is also a full troubleshooting guide available. Salt provides commands to validate the identity of your Salt master and Salt minions before the initial key exchange. Validating key identity helps avoid inadvertently connecting to the wrong Salt master, and helps prevent a potential MiTM attack when establishing the initial connection. Copy the master.pub fingerprint from the Local Keys section, and then set this value as the master_finger in the minion configuration file. Save the configuration file and then restart the Salt minion. Compare this value to the value that is displayed when you run the salt-key --finger <MINION_ID> command on the Salt master. Salt uses AES encryption for all communication between the Master and the Minion. This ensures that the commands sent to the Minions cannot be tampered with, and that communication between Master and Minion is authenticated through trusted, accepted keys. The salt-key command allows for signing keys individually or in bulk. The example above, using -A bulk-accepts all pending keys. To accept keys individually use the lowercase of the same option, -a keyname. Each of the Minions should send a 2018.3.4 response as shown above, or any other salt version installed. Understanding targeting is important. From there, depending on the way you wish to use Salt, you should also proceed to learn about Remote Execution and Configuration Management.